Wikipedia says this definition of repent intransitive verb 1: to turn from sin and dedicate oneself to the amendment of one’s life 2 : to feel regret or contrition b : to change one’s mind. I hear the Lord saying today that this is a day of repentance. If there is anything not right in our lives we should repent. Today is Sunday a holy day for Christians where we go to the sanctuary to worship the Lord….before we go we should spend time in prayer and ask the Lord to reveal our heart and repent….Wash me Lord…sanctify me…Thank you Jesus. Also the Lord wants me to share the words of this song you know so well. He says someone needs to see these words. Lastly today God wants you to know …….That He loves you so much…….Be encouraged today….be encouraged! Malachi 1:6 “A son honors his father, and a slave his master. If I am a father, where is the honor due me? If I am a master, where is the respect due me?” says the LORD Almighty. Malachi 1:14 …… and my name is to be feared among the nations. You cannot fist bump God! My meaning of this is not to get too familiar with God in a disrespectful way. When I hear people say…oh my god…..god dam you….the big guy upstairs…..it makes me sad to think people have such little respect for His Holy name. I also hear…let’s have a Holy Ghost party in here or just yelling Jesus Christ because your upset. Believe me….if God appeared to you ….you would be shaking and quaking in your boots before the Almighty God. One day every knee will bow/every person will bow before God. God is not your boo…..He is not a dude…..or you boy toy. GOD IS HOLY! His name should be hollowed which means to be respected , honored and greatly reverenced. God is perfect…there is no evil in Him….He is divine….He is very very very Holy….He is pure. He is the creator of the whole universe…..there is no beginning and no end to Him and He is so powerful that His mere presence would burn us up like straw…..if He yelled it would destroy us…….He could make everything disappear and bring it back again if He wanted to……He can create many other universes and beings and He probably has. My point is…..do you realize who we are dealing with here? I may not have given the best examples but I tell you……when I go into some of the deepest times I’ve had in prayer with God I have seen some things and have felt some things that have taken my breath away and I tell you….God is unbelievable!!!!! The things I have experienced is things that God has revealed in the bible like what you read in Ezekiel or Revelation….I just experience it in visions and dreams with God through the power of the Holy spirit making it a personal experience for me. God is nothing to play with at all. God the Father, God the Son and God the Holy Spirit is Holy and their names should be reverenced by all who speak it. You know God doesn’t need me to defend His name but I love Him so much and not 100%… but I do understand enough about Him to know He is Holy and should be respected and worshiped. Message for today: Aretha Franklin sang about what it means to her….Rodney Dangerfield begged people for it…but God is the only one who truly deserves it!! All praises be to the Name of The Most High God! Our Father in heaven, hallowed be your name!! 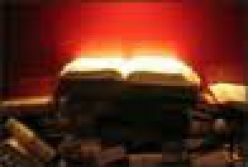 JEHOVAH–YAHWEH…..Genesis 2:4 a reference to God’s divine salvation. An angel is a being that God created to minister to others for Him. The meaning of minister is one who takes care of another person by means of comforting or consoling them, protecting them and doing anything that they are asked to do for that person. It requires the action of doing some task for another which will involve taking care of their personal need or it may be as simple as just spending time with them. Minister is a positive word and has good motives behind it. An example of this would be your pastor who ministers to your spiritual needs….that’s why he is called a minister. Anyone can minister to another person. This morning when I was praying about what God wanted me to share with you I saw many, many angels coming down from heaven and going back up. It was like a highway for angels. In the scripture above Jesus was perhaps emotionally at the most difficult time on His journey to the cross. He was praying so hard to His Father….the only one that could help Him (hint hint…that goes for us to) that He was physically weak. God sent an angel from heaven to minister strength to Him. Now everybody is going to die one day and if you are a Christian there are benefits. If it’s you time to die you will because everyone has that time planned for them and God knows when it is. If it’s not your time and you get into trouble God will send His angel to protect and help you. If you have trouble God will send His angels to help you out in response to your prayers. Have you ever heard stories like a child falling out of a window and lived or someone having a car accident and nobody could find them down in the ravine and they lived after being lost for over a week…..angels. Isn’t it amazing how God has provided all this help for us and yet we still worry about everything. God even told us in His word not to be anxious…..Philippians 4:6 Do not be anxious about anything, but in everything, by prayer and petition, with thanksgiving, present your requests to God. Someone out there is worrying about stuff…..God has got your back!! Do what it says in the scripture above. 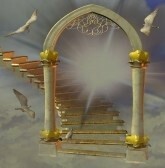 The Holy Spirit of God is there for you and angels are all around you. You are going to be OK! Massage for today: God created the angels and they are at His beckon call and one of their jobs is to take care of you at His command. Pray…ask your Father in heaven for His help and comfort. The Fish Aren’t Biting What Do We Do? Get it?……..go diving after them? I don’t think we should necessarily dive on them but I think we can be wiser in our approach and always follow the Holy Spirits lead. The Holy Spirit is the one who directs us to people when we are available to the Lord. We must be ready at all times and under any circumstance…..whether you are a patient in the hospital, on your job or shopping in a store. Be prepared. A fisherman never goes out without something to catch fish. Have a bible, tracts any kind of materials. You can carry something small in a wallet or handbag. If you have nothing on you because of a very brief encounter with someone you can still be prepared in knowing Gods word in your mind and heart and by knowing how to witness to someone. We all may not be the greatest fisherman but we can all fish. 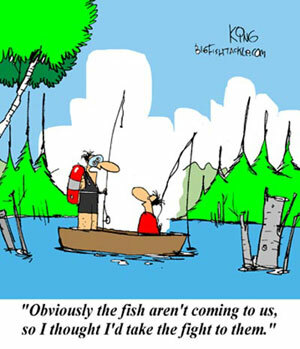 Like the joke above we may have to go after some fish by being where the fish are….get you fishing radar on. Be aware of where you are and who’s around you. Jesus will make that fish notice you. Start conversations with folks. Make comments like…boy it’s a hot one today…put the worm on the hook. Jesus wants us to do this if we are His followers…..but be wise….pray for wisdom…..pray for discernment….pray for the Holy Spirit to lead you….and again be prepared. The light in you and your actions, morals, and integrity are always in full view of others so act accordingly at all times. Remember you are living a holy and sanctified life and it is a witness of the work God has done in your life. Make sure you are spiritually clean because nobody will talk to a stinky dirty fisherman. We are ambassadors for Jesus Christ. Message for today: Go out and do some fishing……is there a prize for your catch?….sure is….Jesus has the rewards and I heard it’s great! You do not need a commentary here to get the meaning of this scripture verse. Jesus was talking to His disciples when He was here on earth and made a statement to them or better yet a command and said…..if you love me then do what I ask you to do and follow my commands. The very first word of this statement really gives me the chills….IF! Jesus of course knew that they loved them…but when I hear that “ if”…it makes my brain say….you know you love Him so do what He says do. They were men and just took it without questioning Jesus, but if I were there I would have whined to Jesus and said “ Jesus you know I love you…why did you say if Jesus…Jesus I really do love you….Jesus don’t you know that because you’re God…Jesus…Jesus. It seems to be very important to the Lord that we follow the commandments that God has laid out for us. It’s not for God’s benefit so He can keep us all in line…but it’s for our benefit ……we will be more like Jesus…..we will lead a holy sanctified life. This is God’s plan and purpose for us. We will please God IF we keep the commandments. Others will see Jesus in us and that will make us available for the Holy Spirit to use us to be a witness. Again IF we love Jesus…and we know we do. You know people don’t like that word obey anymore…kids don’t want to obey their parents…people don’t want to obey the law of the land i.e. driving and texting, stopping at a red light etc. And in this generation women have even removed the word obey from their marriage vows. Well I will tell you with 100% certainty that obey will not be taken out of the bible…ever! So we better get with Jesus program and keep His commands. 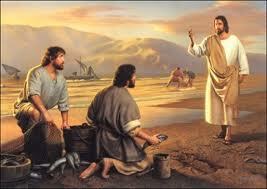 Now Jesus is not forcing us to do this……we are doing it why?…….You got it….because WE LOVE HIM! Many years ago I had a job at Macy’s and I followed and obeyed the commands of that job….not because I loved Macy’s, but because I loved getting paid. That was my motivation. My motivation for obeying Jesus is …because I love Him. I pray this is your motivation too. Now about loving Jesus…..we are so thankful to Him for His sacrifice on the cross…but have we gotten to really know our brother…our best friend. How can you love someone very deeply and be motivated to obey their every command? There are three ways to accomplish this…..bible study, worship and prayer. The ability to connect with these things is through the power of the Holy Spirit. When you spend time in these things daily you can’t help but love Jesus madly. Even trials help us get closer to the Lord. I have a challenge for you today……I want you to tell Jesus as often as you can today how much you love Him…..pretend you hear Him whispering in your ear saying….Do you love me …Do you love me _______(fill in your name here). Meditate on these scripture verses: John 15:9-11 As the Father has loved me, so have I loved you. Now remain in my love. 10 If you keep my commands, you will remain in my love, just as I have kept my Father’s commands and remain in his love. 11 I have told you this so that my joy may be in you and that your joy may be complete. Our love for Jesus must steadily grow and that comes from building a relationship with Jesus, loving Him so much that you break out your alabaster box and pour your precious oil of love and praise on Him. The result of you doing this will be your heart wanting to always obey His commands. God because He is God can never love us more because He already loves us perfectly 100% always and forever. We are mortals so we have to constantly nurture our love by fellowshipping and worshipping with the Lord. Constant interaction is necessary for any relationship we have whether it be marriage, friendship, or family. Message for today: The more you love Jesus…the more you will want to obey His commands. This morning … Gods Speaks I Listen….and share with you. Have courage my children, have courage. These have been difficult days for many and I have heard all of your prayers, cries, and moans and have seen your tears. I have seen many who are worried, anxious, and I’ve also seen those who have put their trust in me. Many people are very angry with me; some don’t understand and ask why. A few of you have even predicted my Son’s return and some say everything is Ok, have faith and stay positive. Everything that you need to know is written in my word. My word is perfect and when you read it, believe it, and receive it in your heart it will do what I intended it to do for you. It is healing, correcting, cleansing, directing, forth telling, convicting…..it can lead you to peace of mind, security in essentials of living, healing…..and it can tell you how much I love you and want the best for you. Please don’t try to understand everything that I do or have to know why for everything. I will at times reveal things, but I need you to trust me. Every morning I’m there with my new mercies for you and my grace is always always there to help you get through all you have to endure. I am there….I am there. I have made it so easy for you to connect with me at all times. There is not one second of the day or night that you cannot talk to me and be with me. Not one thing you ever say to me is ignored. You are my children and I am your Father and I know how to take care of you. I am in you; my Holy Spirit came and took up residence in you when you accepted my Son. When you abide in me your conscience mind has all the spiritual strength you need to make it through any test, trial or just to be with me in fellowship. Yes many things are happening around you and even in your house wholes, but I need for you to do something …..Keep your eyes on me……Yahweh…..I Am the Creator of all things and I have, can and will take care of you! Don’t ever doubt my love for you and my ability to protect you. Keep my word with you at all times…..study it….meditate on it…..it will give you peace and it will help you with the stress and anxiety. This is a race in which you are not without help or direction. You have a coach, egging you on…..water to refresh you and I will be there at the finish line to give you the prize…eternal life….. As I have said in the beginning of my message…. Have courage my children….have courage…..I love you…..